As boxing’s pound-for-pound best, reigning WBA (Super) and WBO lightweight champion Vasyl Lomachenko (13-1, 10 KO) needed to dominate last night (Fri., April 12, 2019) live on ESPN+ from inside Staples Center in Los Angeles, California. Luckily for the champ, he was able to put a stop to English veteran Anthony Crolla (34-7-3, 13 KO) via fourth-round knockout. In typical “Matrix” fashion, Lomachenko took his time in the opening rounds to gauge Crolla’s movements with feints and pressure. Once he downloaded enough information Lomachenko piled on vicious combinations in Round 3 that put Crolla against the ropes and forced a referee break for a technical knockdown. In Round 4, Lomechenko continue to pile on the offense. A few combinations and a body shot backed Crolla towards the corner. 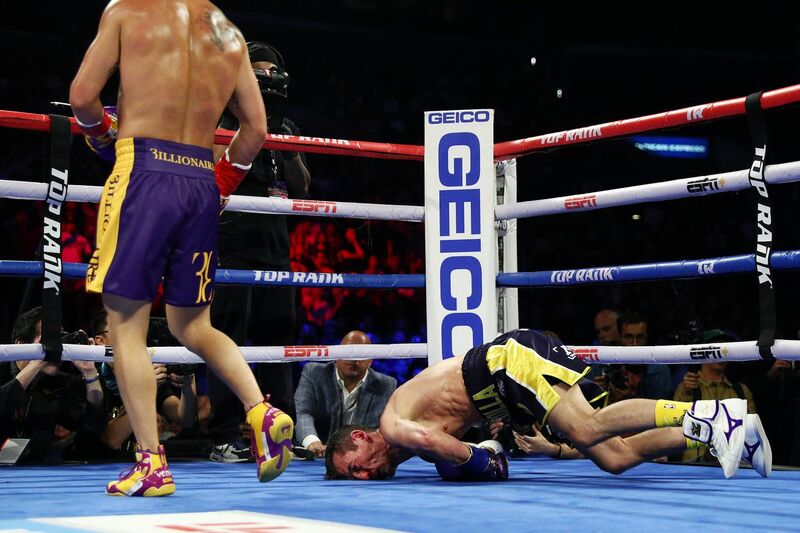 Lomachenko then landed a left hand followed by a brutal right hook on the side of the head that shut Crolla off and sent the Englishman into a faceplant on the canvas. With this win, Lomachenko proves yet again that he’s the best pound-for-pound boxer in the world. The 31-year-old lightweight finally looked healthy after shoulder surgery last year and it showed in his performance against Crolla. “Matrix” is simply dominating the competition at every turn so it may be time to pit Lomachenko against WBC and IBF lightweight champion Mikey Garcia. For complete “Lomachenko vs. Crolla” results and coverage click here. 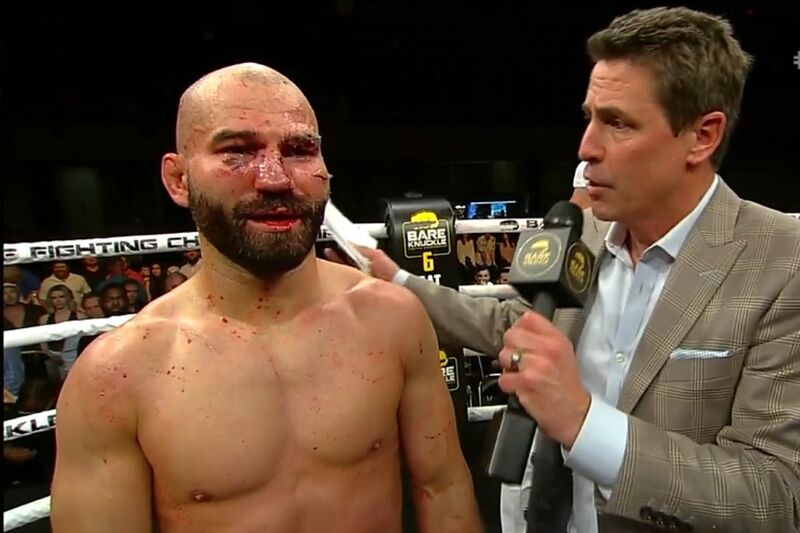 It was an ugly, bloody mess of a fight, but Lobov earned his first bare knuckle boxing win over Knight, taking a hard fought judge’s decision. It was a blood and guts performance from both Artem Lobov and Jason Knight in the main event of Bare Knuckle FC 5. The two former UFC fighters beat each other to pulp across five two minute rounds with the bout going back and forth numerous times with lots of knockdowns. But in the end it was Artem Lobov who was awarded the judge’s decision with scores of 48-47, 48-47, and 48-46. Lobov started the fight out strong, cutting Jason Knight’s face up in the first. By the third round Knight’s face was a mess of blood and Vaseline with Lobov’s punches causing sprays of liquid to rain down in the ring. But Knight got his own damage in, rocking Lobov several times and nearly taking him out in the fourth round. But Lobov was the more strategic of the two, tying up when he was in trouble to recover. In the fifth he seemed to run out of gas, but a similarly exhausted Jason Knight was unable to take advantage and put him away. In his post fight interview, Knight protested the decision. It’s hard to know how to score it. Both men fell and were knocked down multiple times, with no clear count being kept by the commentary team. Both men rocked each other on multiple occasions. But Artem Lobov undoubtedly mangled Jason Knight’s face worse, and seemed to connect with more punishing shots more frequently. Speaking of Lobov, he confirmed he was ready to face former boxing champ Paulie Malignaggi at a future Bare Knuckle Fighting Championship event. The two had a run in on fight week with Malignaggi slapping Lobov during a faceoff. While what we witnessed was an impressive display of grit, we don’t know whether that would go well for Lobov. Malignaggi is a former IBF junior welterweight and WBA welterweight champion. He’s threatened to permanently damage Lobov. Not that it’ll stop the fight from going down anyway. There’s already a date set: June 22nd. What do you think, Maniacs? Excited for Lobov vs. Malignaggi? UFC Fight Night 145 may have started off with three-straight finishes earlier today (Sat., Feb. 23, 2019) live on ESPN+ from inside O2 Arena in Prague, Czech Republic, but the “Prelims” undercard eventually picked up steam as the final four fights all ended in finishes. Leading the way was a superb come-from-behind submission finish by women’s flyweight prospect Gillian Robertson. After warding off early advancements by opponent Veronica Macedo, the 23-year-old Robertson gained top control in the second round and swiftly worked towards Macedo’s back. From there, “Savage” locked in the rear-naked choke. Check out the second-round finish above courtesy of UFC. In addition to Robertson’s third Octagon submission finish, the UFC Prague preliminary card offered a ton of other memorable stoppages. You can view them below courtesy of UFC/ESPN. For complete UFC Prague results and coverage click here. Bellator 216 ‘MVP vs Semtex’ Recap & Highlights! Bellator 216 ‘MVP vs Semtex’ aired Sat. 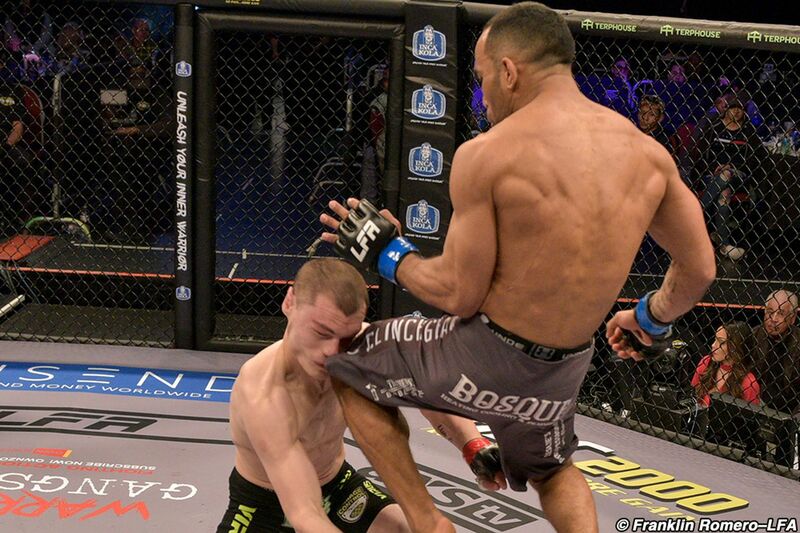 night (Feb. 16, 2019) from Mohegan Sun Arena in Uncasville, Conn. MMA Mania brings you a post-fight recap, results, .gifs and interview highlights from a card with the latest bracket of the Welterweight Grand Prix! Bellator 216: “MVP vs. Semtex” aired last night (Sat., Feb. 16, 2019) exclusively via DAZN from Mohegan Sun Arena in Uncasville, Connecticut. 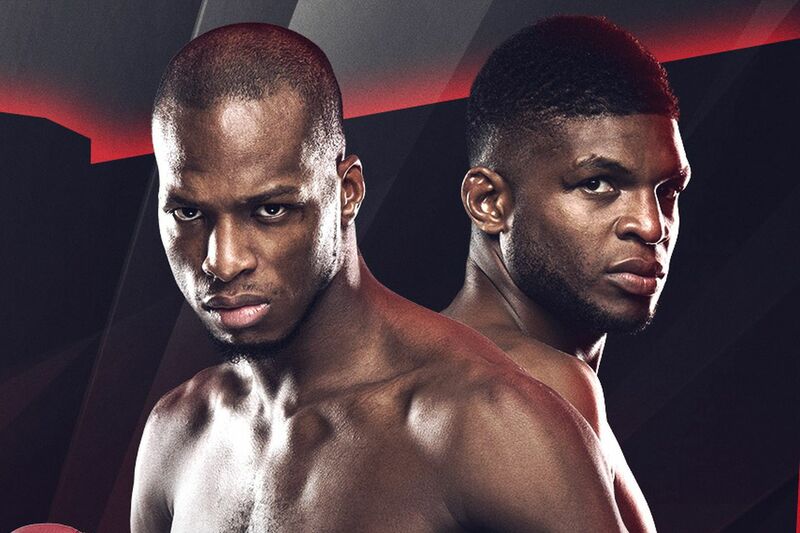 The main event brought the Welterweight Grand Prix back into the spotlight as Michael “Venom” Page (13-0) and Paul “Semtex” Daley (40-16-2) battled for a chance to advance to face Douglas Lima. A horrible first round saw Daley circling laterally on the outside of the cage the entire frame and not throwing a strike. Page didn’t do much more, but he did do more, so the first round would arguably be scored in his favor. The surprising thing that few people expected was that Daley shot for and got takedowns over the next two rounds, stifling any chance at offensive output for Page. Daley was even scoring big shots against the fence when he’d back up and let Page think about getting up. Even in Daley’s dominance for ten minutes there were flashes of Page’s striking style. Page seemed to be in danger of letting the fight slip away completely as we went into the championship rounds, but suddenly Page hurt Daley with a jump knee in the fourth round and took back control. In the fifth round he was able to reverse the takedown attempts and wind up on top doing damage, which gave him the narrow 48-47 win with all three judges. Douglas Lima was waiting to offer his respects in return and his thoughts on the fight. Mirko Cro Cop (37-11-2, 1 NC) looked to settle an old score with “Big Country” Roy Nelson (23-16) after the latter finished him by TKO in round three of their first encounter at UFC 137. Here is your tale of the tape for our #Bellator216 co-main event between Mirko Cro Cop vs. @RoyNelsonMMA. Cro Cop’s first and second round strategy was all about blocking shots by Nelson, turning him into the fence to land the left uppercut, then throwing leg kicks and liver shots whenever Nelson was at range. Watching live it looked a little bit like this. As the time continued to tick away, Nelson lived up to the old J.R. adage of being “tougher than a two dollar steak.” Nelson would occasionally land an effective counter strike or knee in the clinch, but he never scored the big damage he did in his first meeting with Cro Cop. Nelson finally got the takedown he was looking for the whole fight late in round three, but it wasn’t enough to turn the tide as Cro Cop kept it chest to chest and didn’t take any damage in the last minute. This resulted in a unanimous verdict of 30-27 and 29-28 X2 for Cro Cop, winning his seventh out of seven rematches to date. “Big” John McCarthy spoke to Cro Cop after the result was made official. This was not the only Heavyweight rematch in store for the evening. 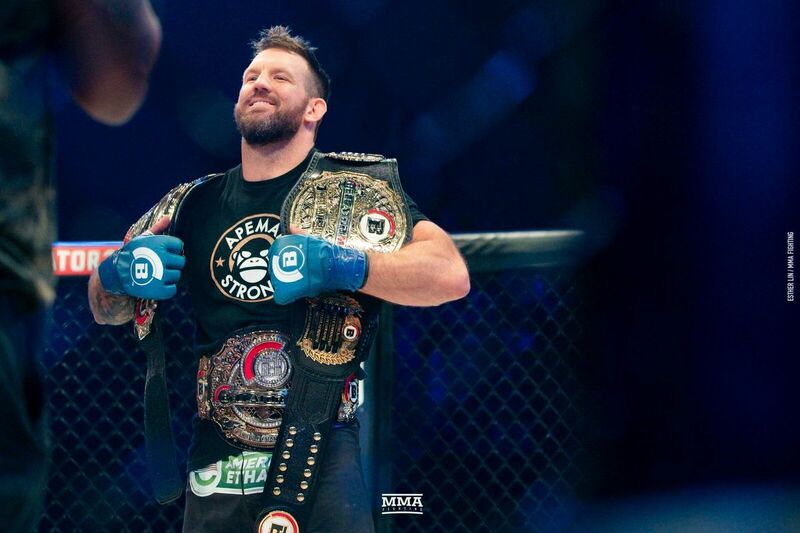 Dating all the way back to Bellator 115, a renewed rivalry saw former Heavyweight champion Vitaly Minakov (21-0) try to knock off Cheick Kongo (29-10-2) again, the latter riding a seven fight win streak. Minakov was the aggressor throughout the first round, charging forward to throw looping hooks, getting clinches, and taking Kongo off his feet. Kongo turned the tide in the second and third round, though it may have been hard to tell due to long periods of inactivity by both men. The difference in the scoring was during those lone minutes of activity, Kongo was scoring with uppercuts and knees, depleting Minakov’s gas tank to the point that at the end of the third round he was doubled over on his hands and knees. @Kongo4Real is your winner in the heavyweight feature fight at #Bellator216 tonight. Kongo recorded the victory via unanimous decision of 30-27, 29-28 X2, avenging his previous loss to Minakov and extending his win streak to eight. He explained the long periods of inactivity to “Big” John McCarthy afterward. An exciting Welterweight fight saw the undefeated Yaroslav Amosov (20-0) face off with Erick Silva (20-9, 1 NC) in his long-awaited Bellator debut. Yarslov Amosov & @ErickSilvaMMA are fighting live on our main card now!! Here is your tale of the tape! The only round where Amosov seemed to have any trouble with Silva was the first, where dynamic striking gave “Dynamo” pause and even drew a little blood, but it was a close frame either way. The next two rounds were dominated by takedowns, some of them hit with emphatic authority, preventing Silva from doing anything whatsoever but getting up to get thrown to the ground again. The judges scored it all for Amosov 29-27 and 29-28 X2. No post-fight interview followed. Finally a Flyweight bout between newcomer Valerie Loureda (0-0) and her more experienced foe Colby Fletcher (1-2) kicked off the main card. Here is your tale of the tape for our first bout on the #Bellator216 main card between @ValerieLouredaa vs. @TeamColby_93. Loureda is recognized as a Taekwando master and showed off why with a flurry of strikes from all angles until she dropped Fletcher with a combo and body kick. She poured on right hand hammerfists until Kevin MacDonald stopped it by TKO at 2:55 of Round 1. @ValerieLouredaa with the hammer fists to cement her win tonight at #Bellator216. She spoke to John McCarthy about her triumphant pro debut afterward. For complete Bellator 216 results and coverage click here. Bellator 214 ‘Fedor vs Bader’ Recap & Highlights! Bellator 214 ‘Fedor vs Bader’ aired Sat. night (Jan. 26, 2019) from The Forum in Inglewood, Calif. MMA Mania brings you a post-fight recap, results, .gifs and interview highlights from a card where Fedor Emelianenko and Ryan Bader fought for the 265 lb. crown! Bellator 214: “Fedor vs. Bader” aired last night (Sat., Jan. 26, 2019) via Paramount Network from The Forum in Inglewood, California. A year long Heavyweight Grand Prix came to its epic conclusion as Fedor Emelianenko (38-5, 1 NC) and Light Heavyweight champion Ryan Bader (26-5) fought to crown a new 265 lb. champion. Just 35 seconds in the fight and the imitable Mike Goldberg would be yelling “IT IS ALL OVER!” Bader clipped Emelianenko with a lead left hook, followed up with a right hand as Fedor was falling down, and got two more lefts flush before referee Mike Beltran had to save him. Take a look! Bader spoke to John McCarthy afterward. Featherweight sensation Aaron Pico (4-1), winner of four straight fights, sought to prove his credentials one more time against a more experienced opponent in Henry “OK” Corrales (16-3). Even though Pico is known for his incredible stopping power, and did momentarily rock Corrales with an uppercut, when the two did a mutual clinch and started throwing haymakers like a throwback bar brawl it was Corrales who landed the killer right hand that made Pico fall back unconscious at 1:07. A stern looking Corrales spoke to “Big” John McCarthy after the BIG win. About ten more seconds of shout outs to people were also censored on the broadcast. A special attraction for the main card saw the man formerly known as Jack Swagger make his pro MMA debut as Jake Hager. To give him his best chance to succeed they paired him with J.W. Kiser (1-1), who didn’t seem to know where or for whom he was fighting. Hager and his friend Ron Killings certainly knew. Kiser fared slightly better than you’d expect, circling on the outside and connecting with a right hand to the head when Hager shot in, but Hager easily took him down and got on top in half guard. He considered a kimura but didn’t have the leverage for it. He did however succeed with a head and arm choke, getting Kiser to tap out at 2:09 of round one. After his first win Hager spoke with “Big” John McCarthy. Bantamweights with only two losses between them stepped up for the main card as Juan Archuleta (21-1) faced off with Ricky Bandejas (11-1). There was one clear round for each man. Archuleta constantly switched his stance and knocked Bandejas backward with his surprising charges forward to throw big blows. Bandejas stuffed multiple takedowns in the third round and hurt Archuleta with head kicks throughout the third round. It would be up to the judges to decide it based on a close second round that could’ve gone either way. All three scored it 29-28 for Juan “The Spaniard” Archuleta by unanimous decision. Ilima-Lei Macfarlane and Rory MacDonald were at cageside to promote the recently announced Bellator card for April 27th. Macfarlane spoke about facing Veta Arteaga. MacDonald talked about facing Jon Fitch in the final opening round bout of the Welterweight Grand Prix with his title on the line. The opening bout of the card was Brandon McMahan vs. Adel Altamimi. Altamimi saw his brothers killed in front of him in Iraq before he was saved by the Marines, and he ultimately received a Bellator contract after training at Jay Glazer’s MVP gym (Merging Vets and Players). He made the most of it by winning via armbar 76 seconds into the fight. Afterward he spoke to John McCarthy with Chris Pratt (yes that Chris Pratt) by his side. For complete Bellator 214 results and coverage click here. The action delivered on arrival last night (Fri., Jan. 25, 2019) at LFA 58 live on AXS TV from inside the Route 66 Casino Hotel in Albuquerque, N.M., as lightweight prospect Harvey “Fightbot” Park defeated Jaleel Willis via first-round TKO in the main event. Check out the complete video highlights above courtesy of AXS TV. Legacy Fighting Alliance (LFA) always seems to pull through with the highlights, evident by the back-to-back main card knockouts that combined for a total of 90 seconds of cage time. It was quite impressive and the perfect kickoff to a weekend showcasing a heavyweight title fight between the great Fedor Emelianenko and Ryan Bader later tonight (Sat., Jan. 26, 2019) at Bellator 214 from Inglewood, California. 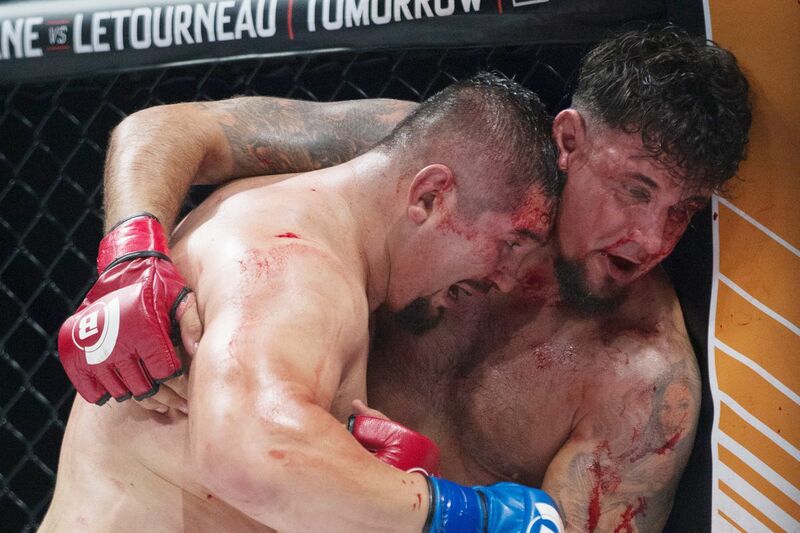 Bellator 213 ‘Macfarlane Vs Letourneau’ Recap & Highlights! Bellator 213 ‘Macfarlane vs Letourneau’ aired Sat. night (Dec. 15, 2018) from Neal S. Blaisdell Center in Honolulu, Hawaii. MMA Mania brings you a post-fight recap, results, .gifs and interview highlights from a card where Ilima-Lei Macfarlane defended the title against Valerie Letourneau! Bellator 213: “Macfarlane vs. Letourneau” aired last night (Sat., Dec. 15, 2018) via DAZN from Neal S. Blaisdell Center in Honolulu, Hawaii. 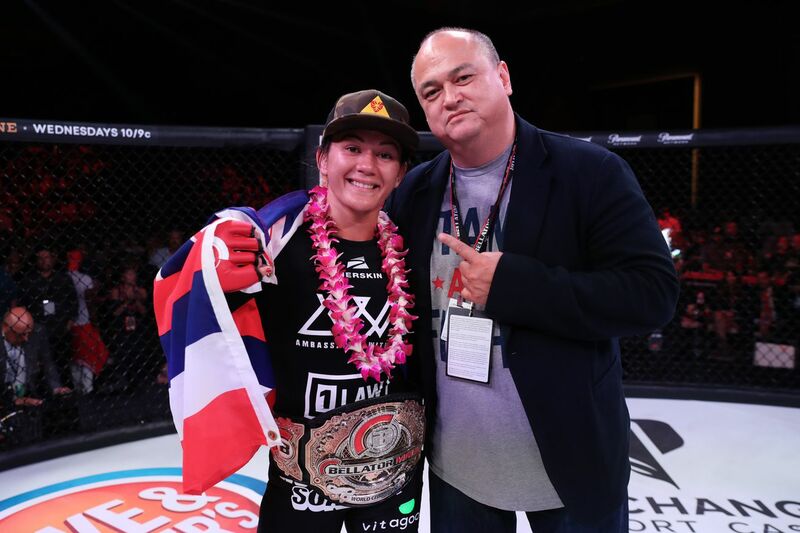 The Flyweight title was on the line in the main event as the undefeated Ilima-Lei Macfarlane (8-0) took on former UFC contender Valerie Letourneau (10-6), looking for her third straight Bellator win. At the start it looked as though Letourneau was willing to use her physical attributes to her advantage, staying at distance and forcing Macfarlane to come to her. They exchanged leg kicks, Macfarlane occasionally found the range, but it was a toss up to this reporter who landed more often. Even “Big” John McCarthy said it was “real close” afterward. The second round was not any easier to call. Letourneau was taken down 12 seconds in but Macfarlane may have made a mistake by stepping back to come over the top. She wound up too high on top of Letourneau, who was able to reverse the position and deck Macfarlane with a couple of hard rights. Macfarlane survived but may have lost R2. The third round was when everything started to flow decisively in one direction. Despite Letourneau’s attempt to widen her stance and stuff the takedown, a relentless Macfarlane drug her to her knees, battered her with her hands, then completed the takedown and took her back with over three minutes to work. When Macfarlane has your back with that much time left you’re in deep trouble. Letourneau fought off an armbar but it was the setup to cinch the triangle choke, and Letourneau had no choice but to tap at 3:19. A visibly emotional champion spoke to John McCarthy after successfully defending her Flyweight title on home soil in her home town. In addition former UFC Light Heavyweight champion “The Dragon” Lyoto Machida (24-8) took on former Bellator Middleweight champion Rafael Carvalho (15-2). The first round was bad news for Machida as Carvalho broke his nose with a stiff punch. The second round appeared to swing toward Machida as he rang Carvalho’s bell with a head kick. Things got even better when “The Dragon” got a takedown to full mount in Round 3. Carvalho was game though and survived everything, including a late guillotine attempt when he got up from one last takedown. At least one judge thought Carvalho did enough standing to give him two rounds 29-28, but the other two saw it the same for Machida. He spoke to John McCarthy after winning his Bellator debut. Undefeated fighters also took their share of the spotlight as jiu-jitsu specialist Neiman Gracie (8-0) took on collegiate wrestler turned MMA star Ed Ruth (6-0). Ed Ruth proved to be a survivor early as he avoided a triangle in the first, two attempts to grapevine his leg in the second, and a very nasty looking armbar in the third. Unfortunately for Ruth the Welterweight tournament bracket calls for extra rounds and the fourth was his undoing. Gracie took down the collegiate all American with a blast double, had a full mount 25 seconds later, and when Ruth gave up his back the rear naked choke finished it at 2:17 of Round 4. Although Gracie had fewer words here than in our interview with him he made every one count when “Big” John McCarthy gave him the mic. Light Heavyweights looking to regain their standing in the division stepped up in Hawaii as “King Mo” Muhammed Lawal (21-7, 1 NC) took on Liam McGeary (12-3). Both men needed to bounce back from recent defeats, but McGeary needed it more after dropping two in a row and fought like a man with his back to the wall. Lawal’s strategy was to attack the leg a la Vadim Nemkov but didn’t do enough damage to make McGeary fall. By the end of the second round McGeary’s confidence was growing as he had hurt Lawal with combos and then rocked “King Mo” with elbows to the head on a takedown attempt. McGeary finished it in the third with a big right hand that made Lawal fall straight backward — a head kick shaving his dome as he fell to the ground. The official time of the knockout was 53 seconds. Local Lightweight prospects with equal records squared off at 1-0 as Kona Oliveira faced Nainoa Dung. Someone’s “oh” was about to go. Oliveira seemed to have things in hand in the first two rounds scoring takedowns and working on top, although Dung made the second round more competitive than the first with his strikes. These boys are goin’ at it! Dung turned things around in the third by blocking a takedown, searching for an anaconda choke from the front headlock, then transitioning to full mount and laying on a beating. “Big” John McCarthy, the crowd and Oliveira felt it was stopped early though their opinions can’t overrule the referee, who officially awarded the win to Dung at 2:05 of Round 3 by TKO. He spoke to McCarthy afterward. For complete Bellator 213 results and coverage click here. Former UFC heavyweight champion Frank Mir experienced a career first last night (Fri., Dec. 14, 2018) at Bellator 212 from inside Neal S. Blaisdell Arena in Honolulu, Hawaii, when he tapped out due to strikes in the second round of his co-main event clash with Javy Ayala. With his daughter in his corner, Mir battled hard throughout the heavyweight fight to gain top position and tire Ayala. That was until Ayala forced the fight to the feet in the second round and started to strike with Mir in the clinch. Hard elbows and short punches bloodied Mir’s face and eventually forced the heavyweight veteran to signal for a tap on the back of Ayala’s head. The unexpected finish can be seen above. While most of us watching, including the cageside commentators, thought Mir tapped due to strikes because he couldn’t see, the former UFC standout actually suffered a fractured alveolar ridge after his mouthpiece fell out for well over a minute. Per wikipedia, the alveolar ridge is one of the two jaw ridges, extensions of the mandible or maxilla, either on the roof of the mouth between the upper teeth and the hard palate or on the bottom of the mouth behind the lower teeth. Mir, 39, thought he had injured his actual teeth and tried to pull them out to continue. Once he realized the severity of the injury and the pain associated with it he had nothing left to do but tap for the first time in his career. This is pretty wild considering Mir has fought the likes of Fedor Emelianenko, Mark Hunt, Alistair Overeem, Brock Lesnar, Daniel Cormier, Junior dos Santos, and so on, and this sort of thing has never happened. I guess that’s what you get when you fight a hard-punching heavyweight like Ayala with no mouth piece for nearly 90 seconds. We’re hoping Mir doesn’t sustain any long lasting injuries and gets back into the Bellator cage as soon as possible, especially considering last night’s fight was extremely entertaining leading up to the stoppage. For complete Bellator 212 results and coverage click here. 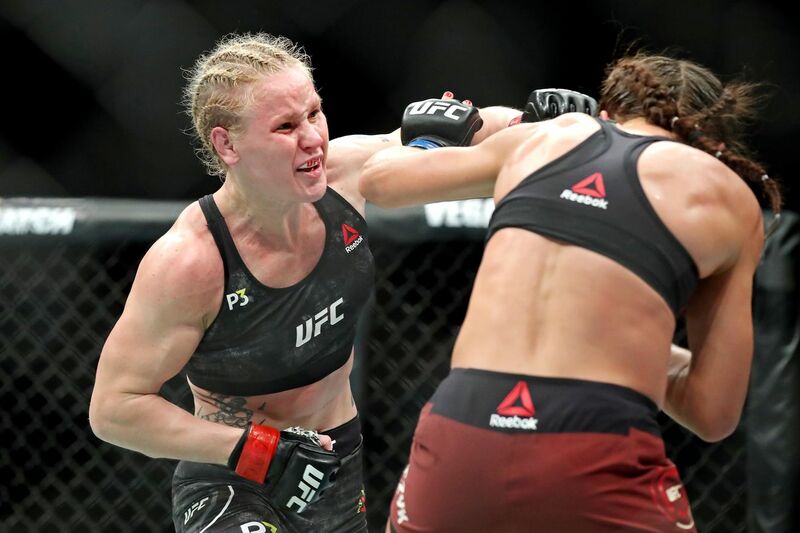 Valentina Shevchenko was simply too much for Joanna Jedrzejczyk last night (Sat., Dec. 8, 2018) at UFC 231 live on pay-per-view (PPV) from inside Scotiabank Arena in Toronto, Ontario, Canada, as “Bullet” defeated the former UFC women’s strawweight champion via unanimous decision to claim the vacant women’s flyweight title. It was all Shevchenko in the early going. The Polish contender utilized her strength and positioning to get inside on Joanna and secure a few slamming takedowns. Jedrzejczyk did get back to her feet, but Shevchenko made her pay with spinning kicks to the body and front kicks to the face. Shevchenko did fade a bit in the later rounds which allowed Joanna to tally some points on the scorecards, but it was simply too late. Shevchenko was the better and more effective fighter throughout this championship bout and proved that 125 pounds is really the best division for her. Maybe a matchup with the always game Jessica Eye? For complete UFC 231 results and coverage click here.